This ultra slim manicure lamp is positioned right above the hand but below the eyes. Shows accurate polish color on nails. Clamps easily to manicure tables. Slim head design provides perfect bright shadow free lighting. Height adjustable with 2 unique flex points directs the light exactly where needed. Energy saving LED reduces eye strain and provides true color matching. Brushed Chrome finish. 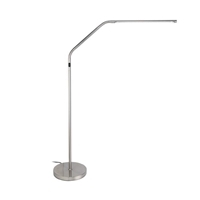 Specially designed for the Slimline Table lamp • Irresistible brushed stainless steel finish. 5lbs. Non-scratch / non-slip felt • Diameter: 8.7"